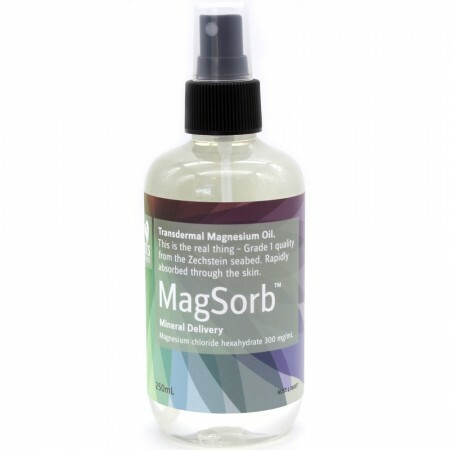 Transdermal Magnesium Oil sourced from the ancient Zechstein Seabed in Europe. Many of us are magnesium deficient, and magnesium oil has been proven to have higher effectiveness than oral supplements. Magnesium assists in muscular relaxation, and can assist in the relief of muscular cramps or spasms caused by magnesium deficiency. 250ml. Contains no unnatural ingredients or chemicals. Safe for you and the environment. Assists in muscular relaxation, and can assist in the relief of muscular cramps or spasms caused by magnesium deficiency. Magnesium is essential for many cellular functions, such as those involved in energy production and muscle and nerve tissue function. Extracted from the ancient Zechstein Seabed in Europe, which is over 250 million years old. Carefully extracted from 2000 meters deep in the earth, giving the magnesium a very high natural energetic state. Spray the magnesium oil into a cupped hand and gently massage on your muscles and joints. Add 30ml to a warm footbath, and soak feet for 30 minutes. Add 25 - 50ml to a warm bath, and soak for 30 minutes. Don't use on the face, or on damaged, cracked or broken skin. Test on a small area of skin before using. Magnesium chloride from an ancient seabed and water. 300mg of magnesium chloride hexahydrate per ml. Browse our other body oils and bath salts.